In a path-breaking new research, scientists from University of Minnesota have found success in 3D printing functional and biological materials on a real hand for the first time. Using a customised 3D printer, the researchers printed temporary electronics on human skin capable of detecting chemical and biological agents. The research will have a profound effect on a multitude of applications wherein temporary electronics and sensors can be easily printed for specific applications and then as easily removed once the job is done. The research has touched some very novel innovations. Below is the list of some of them. The researchers were also successful in printing biological cells on a skin wound of a mouse. Researchers believe this technique could lead to medical treatment breakthroughs for medical healing and direct printing of skin grafts. The research is not only novel in the sense that it can print on human skin but the researches also considered a lot of inherent flaws of printing on a human body part. One of the important innovations of the research is that the 3D printer allows for small movement of the part where the printing is taking place. This is in accordance to the fact that a person, no matter how much restrained, will make small movements. For this, temporary markers are placed on the skin surface and the skin is scanned. The printed then uses a computer vision to adjust to the movements in real-time. Another unparalleled innovation of this research lies in the usage of special inks for printing. These inks are made of silver flakes which surprisingly can be cured at room temperature and additionally they even conduct at room temperatures. This is unlike other exiting 3D printing inks which need to be cured at high temperatures, close to 100 degrees Celsius or 212 degrees Fahrenheit. This would definitely burn the body part. Lastly, the electronics printing is temporary and it can be as easily removed as simply peeling it off with tweezers or washing it off under water. 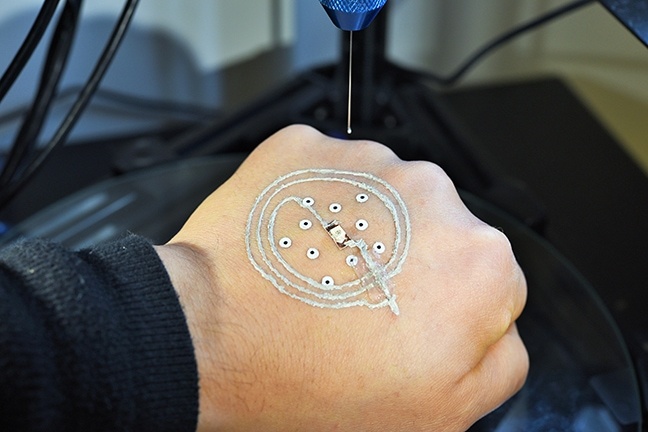 The researchers believe that the study has applications like 3D printing electronics and sensors for defence and medical applications, wound healing, direct printing of skin grafts, etc. The research was a collaborative effort of a long list of members and most importantly, Michael McAlpine, the lead author of the study and the University of Minnesota Benjamin Mayhugh Associate Professor of Mechanical Engineering, a world-renowned expert on treating rare skin disease & University of Minnesota Department of Pediatrics doctor and medical school Dean Jakub Tolar. The research paper titled, 3D Printed Functional and Biological Materials on Moving Freeform Surfaces was published in Journal of Advanced Materials on 25th April, 2018. The study was funded by grants from the National Institutes of Health and state-funded Regenerative Medicine Minnesota. In addition, the first author of the paper Zhijie Zhu was funded by a University of Minnesota Interdisciplinary Doctoral Fellowship. About Manufactur3D Magazine: Manufactur3D is an online magazine on 3D Printing. Visit our Tech News page for more updates on 3D Printing Technology News. To stay up-to-date about the latest happenings in the 3D printing world, like us on Facebook or follow us on Google+.